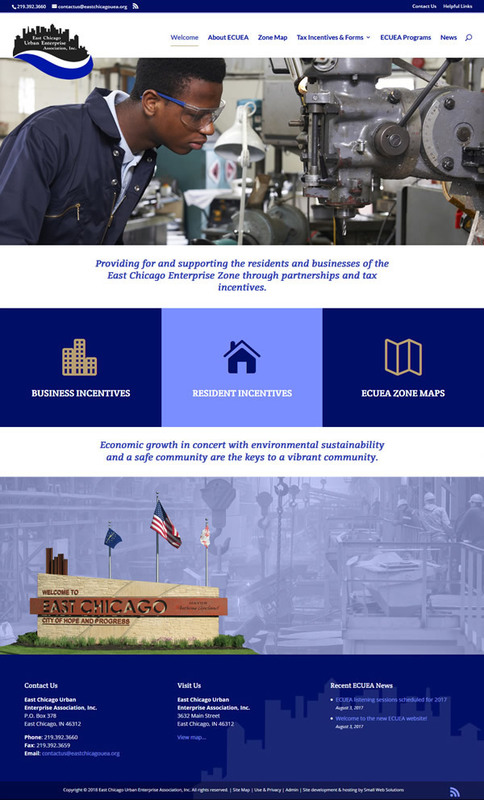 Owner: East Chicago Urban Enterprise Association, Inc.
Site Features: This is a fully integrated custom WordPress website that uses WP as a content management system for all site pages and news feed articles. This allows the client to edit page content at-will. This particular WP theme also uses modules that allow for easy drag-and-drop positioning and editing. WP plug-ins include fully customizable photo galleries, the ability to manage meta tags for search engine optimization, and upload photos and documents. Design Features: This site is fully responsive to all types of desktop, laptop, tablet and mobile devices. Home page features include a slideshow incorporating the company’s values and offerings. Subpage & global features: Options to upload and assign particular header images to any subpage, integrated Google Analytics tracking, site search functions, automatic copyright updating, automatic site map, masked email to combat auto spam.